This motherboard was purchased new and stopped working just after 3 months of operation. Since it was urgent to repair that computer, I bought a new motherboard and processor and left the old one aside and forgot about it, without going into the process of replacing it under warranty. All it did each time I tried to power it up, was the CPU fan running for a second and then going out again and then running for another second and so on. But now, after almost two years having passed, I found it again and decided to run some tests just in case it was repairable. 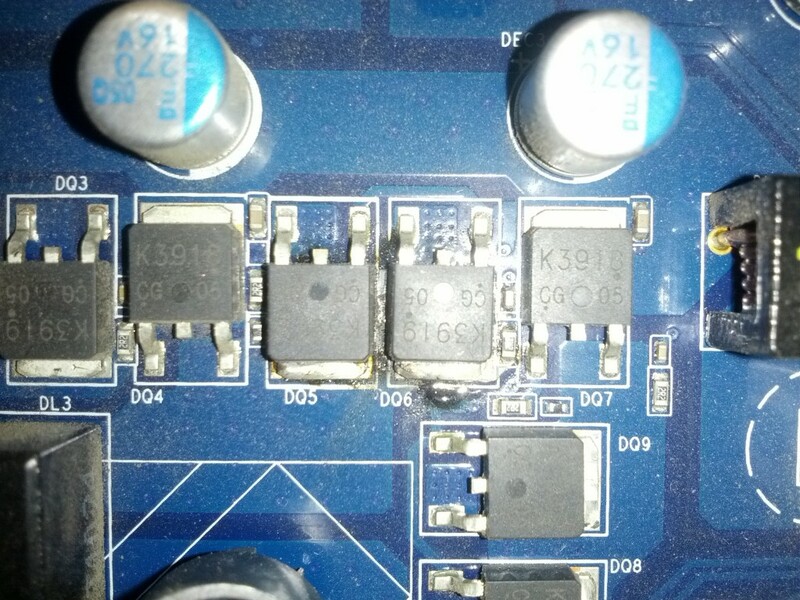 At first glance there was nothing visibly wrong on the board, such as a blown capacitor or signs of charring. After a more careful visual inspection I found two mosfets near the processor that were slightly blackened and also the solder mask around them, (ie the protective varnish on the surface of the board) had a small lump. This was a sign of local overheating. I measured the resistance between Drain and Source and it was just a few Ohms. This was a bad sign because normally it should be at least a few hundred Kohms. However, because the measurement was made in-circuit there is always the possibility that a low-resistance, parallel circuit was measured as well. So I decided to remove the two mosfets from the motherboard in order to check them again, this time off–circuit. If they proved to be damaged I would replace them with others salvaged from another motherboard. 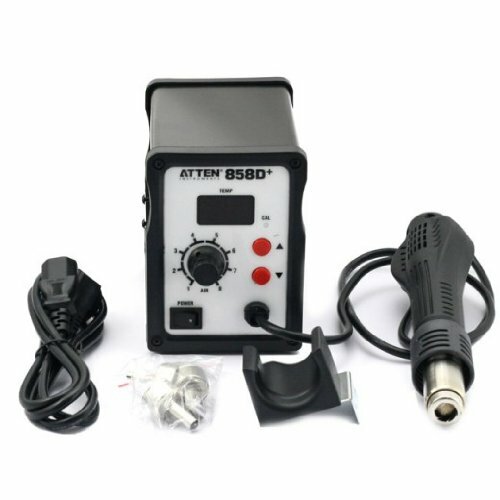 since these are surface mount devices (SMD) and can not be removed with a conventional soldering iron. 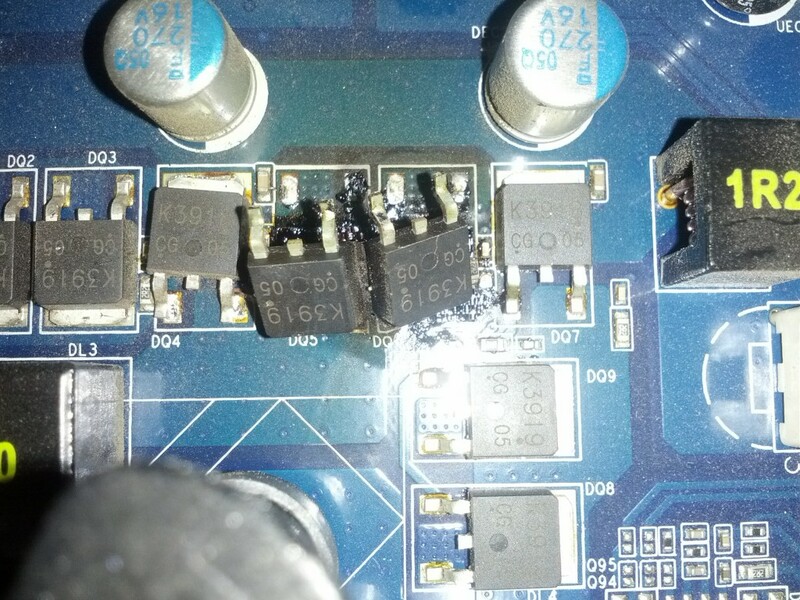 Unfortunately, even after several minutes of heating them up with air at 450C, these two mosfets would not come free! On the contrary, the two adjacent ones were already dislodged and could be moved freely. It was apparent that the solder mask had melted locally, had become a single body with the mosfets and wouldn’t let them free. With some effort I managed to lift them a little, but the overheating had damaged the board below the mosfets. The mosfets were lifted along with the copper pads below them and an SMD resistor next to them, while another copper trace was cut. The motherboard was by now properly FUBARed but at least now I could check the mosfets off circuit, just out of curiosity. Eventually only one of them was damaged, with a 3 Ohm Drain to Source resistance, while the other was simply blackened by the high temp but still functional. Unfortunately, as usual, I failed to repair yet another electronic device. I hope I have better luck next time!